Chef Rob Stinson attended Miami University in Oxford, Ohio, majoring in business management. He trained under Cordon Bleu Chef Gerald Thabuis; former Chef for President of France, Charles DeGaulle; Master Italian Chef Ciro Cuomo and Creole Chef Nathaniel Burton. 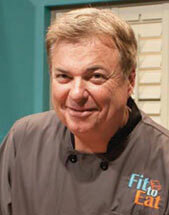 Stinson is executive chef and owner of three award-winning restaurants on the Mississippi Gulf Coast. His spectrum of work has spanned from five-star dining at the Windsor Court Hotel Grill Room, to managing the highest volume restaurant in the world, Orlando Planet Hollywood. In 2007 and 2009, he was chosen by Governor Barbour to represent the State of Mississippi as official chef in the Great American Seafood Cook-off in New Orleans. He is the official chef of the Mississippi Department of Marine Resources Seafood Marketing Program. Rob, his wife Paige, and children Samuel and Abigail live in Long Beach, Mississippi.